Tom Dewell, JZ Knight, Joseph Bravo, Jason Witherow, Michael Wagar, and Ronelle Funk. 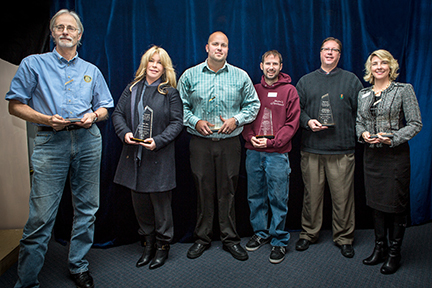 On Tuesday, December 10, 2013, JZ Knight accepted the Yelm Chamber of Commerce 2013 Business of the Year award in the “50 or more employees” category at the Forum luncheon meeting’s award ceremony. Yelm Chamber Executive Director introduced Knight’s award and Mayor Ron Harding was on hand to make the presentation and shake hands with each of the winners, followed by Chamber President Ronelle Funk adding her congratulations to the winners, as well. Funk reported this was the first year that Chamber members sent in their nominations for award winners, where formerly the Chamber’s Board selected the annual recipients. Knight and Nisqually Valley News Publisher/Editor Michael Wagar brought their entire staffs to the luncheon presentation, which added to camaraderie of the monthly meeting. This 2013 Yelm Chamber of Commerce Christmas Extravaganza Award went to JZ-Rose, tied with Tim’s Pharmacy.